Deaf-blindness is a unique disability. It is a combination of visual and hearing disability which limits activities of a person and can restrict full participation in a society. To overcome this, the individual needs specific services, such as environmental adaptation and/or technology. Brian is a boy living with deaf-blindness. He became deaf-blind after suffering from malaria at the age of 9 months. Since he acquired this disability, Brian was being locked in a house by his mother for fear of bumping into objects. Therefore he developed poor posture, mannerisms, and he could not move around. He is enrolled at Chisombezi Deaf-blind Centre about 650 km away from his home. “Brian’s mother communicates to Brian that it’s time for eating porridge by pulling his hand with force. Brian does not know what happens; therefore he refuses by pulling back his hand. Mother continues pulling Brian’s hand; Brian communicates to his mother by using body language. Brian’s mother does not understand this and he continues pulling his hand with force again. There is miscommunication between Brian and his mother. Brian did not know that the pulling of his hand meant time for eating the porridge. This is a clear example of how family members need assistance in learning to communicate with persons who are deafblind. Lack of communication skills leaves persons with deafblindness without access to information, support services, and the environment. Based upon a survey conducted by Visual Hearing Impairment Membership Association (VIHEMA) and the Malawi Council for the Handicap (MACOHA), it is estimated that there are more than 395 persons who are deafblind in Malawi. Of this number, 250 are children of school-going age. Only 13 children attend Chisombezi Deaf-Blind Centre, a school established by the Roman Catholic Sisters of the Servants of the Blessed Virgin Mary (SBVM), with support from VIHEMA. Located in Chiradzulu district, in the southern region of Malawi, the school gets financial support from Signo Foundation from Norway. The situation for people with deaf-blindness in Malawi is very critical. There is only one school for children who are deaf-blind and there are no support services for them. 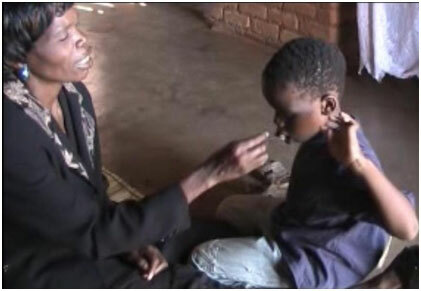 The Malawi government has not yet established an education programme for deaf-blind persons. Because of this many children who are born deaf-blind have minimal survival chances, and die before they reach the age of four years. The National Special Needs Education Policy (2011) states that all persons with disabilities shall receive education of good quality. In 2013 the International Council for Education of People with Visual Impairment (ICEVI), in partnership with the Ministry of Education, Malawi Union of the Blind (MUB), VIHEMA, Sightsavers, and other partners launched the EFA Campaign for the visually impaired in the country. These partners call upon the Malawi government to work hand-in-hand with them to establish and support units where deaf-blind children can access education and other support services. Through support from the EFA Campaign, the Ministry of Education and MUB have already begun public awareness and capacity building programmes to promote access to education for the visually impaired. Moving stories, like that of Brian, serve to make people of the needs of children who are deaf-blind. The Ministry of education should train teachers in deaf-blind awareness programmes as soon as possible to minimise unnecessary deaths of deaf-blind children. Once the services are provided, deaf-blind persons can become productive citizens who can contribute to the socio-economic development of Malawi and live an independent life. The Uganda Braille Cup Competition took place in June 2013, just a week after the Education for All Children with Visual Impairments (EFA-VI) Campaign was launched by the International Council for Education of People with Visual Impairment (ICEVI) in Uganda. The Uganda Braille cup competition was the first of its kind. The event was supported by Perkins International, ICEVI, and Kyambogo University, which also hosted the event. It drew participants from 11 schools and various stakeholders. The activity was spearheaded by Uganda National Association of the Blind (UNAB). Nakawooya Victoria is one of the participants, who participated in the Braille Cup Competition on 14th June, 2013. 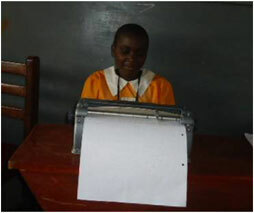 She is 14 years old, in primary seven, and studies at Salama School for the blind in Kampala. In her success story, she says, her ambition is to become an accountant, which requires her to read well, especially Mathematics Braille signs and symbols. Participants to the event had to vigorously prepare in advance and so did Victoria and her teachers. Improve her thinking capacity especially due to the time allocated to the questions. She goes on to say that the competition has also made her pay attention to time management, especially during examination periods. It has also enabled her to acquire more friends which she did not have before. She adds that it was during this time that she acquired a white-cane to improve on her mobility both at school and at home. Victoria emerged as a winner in the primary division, earning a trophy and a Perkins Brailler. She feels proud for having contributed towards the success of her school. She says this is a great legacy she will leave for those who will enrol after her, especially girls with visual impairment, who experience the double stigma of being female and having a disability. 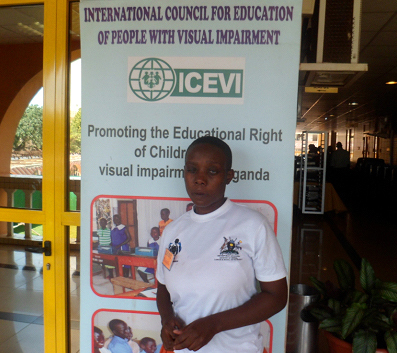 She also thanks ICEVI for supporting the competition in particular, and she hopes that the agency and its EFA Campaign shall continue the work in Uganda and to support the Braille Cup Competition in the future. Ashraf Muzafaru is a 23 year old boy who stays with his grandmother known by the name Nalongo Naava. They stay in Mpambire along Masaka Road. His father abandoned his son in 1999 leaving the burden with the wife who also passed away in the year 2000. Ashraf was born in 1991 without any disability. He started school at the age of 3 years and was immunized during the national polio prevention exercise in his top class at the age of 5. The guardians claim that it was this national immunization exercise that led to the death of many of other pupils in his school. The few that survived acquired disabilities. Ashraf was one of the survivors whose situation intensified which led to his admission to hospital for 2 years and stayed in a coma for 9 months. His stay in coma led to his physical and visual impairment. In addition to gradual loss of sight his right hand and leg are weak. Ashraf’s Aunt who stays in Namugongo visited UNAB offices seeking for assistance concerning her nephew’s condition. In response, she was informed that UNAB would send a team to pay him a visit and carry out an assessment as well. To this effect, the EFA-VI team from UNAB went to Mpambire on 18th March, 2014 to assess Ashraf’s condition. During the assessment, it was discovered that the client had the ability to run a number of errands despite the challenge. Ashraf is very well able to perform his activities for daily living e.g. washing face, brushing teeth, wash light clothes among others. However, Ashraf sells water to earn himself a living. He is eager to leave this business to join school so as to earn skills and knowledge to make his life more meaningful. It is against this background that the EFA-VI team recommended that he should be trained in vocational skills. Much as the client is good in most of the daily activities around home, including orientation of the home environment, he is very poor in white-cane use and does not involve his paralyzed hand when working. Ashraf’s family is positive because they involve him in most daily activities and it further went ahead to seek for the solution to his situation from UNAB. UNAB to avail Ashraf with a white-cane and also train him on how to use it. Guardians to continue with the training in the absence of the UNAB EFA-VI team. UNAB EFA-VI team to involve Ashraf’s parents in future EFA-VI capacity building programmes. UNAB to train and support Ashraf in a vocational skill. UNAB to consistently follow-up on Ashraf’s progress. During the activities carried out prior to the Day of the African Child, a visually impaired pupil of Spire Road Primary School was identified by the Uganda EFA-VI team. She is known by the name of Kifuko Grace and is in Primary Six. From further interaction with her, it was discovered that Grace had been out of school for 4 years due to lack of finances and had just been brought back to school. Her ability to stay on is further threatened by the fact she relies on her Aunt who is also struggling to make ends meet to pay school fees. Grace also does not have a white-cane to aid her movement. Miss Sandra Sikaaku is a resource teacher of the blind in the National Senior High Inclusive School in Cape. She is one of the beneficiaries of the capacity building training workshop for senior high teachers in low vision supported by ICEVI, EFA-VI Campaign in Ghana. She is a resource teacher for the past eight years but had never had any opportunity to refresh her knowledge after university. 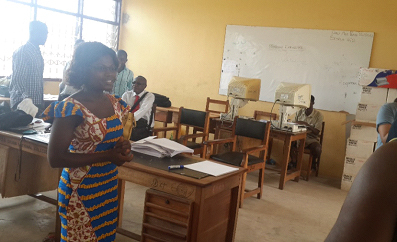 During a follow-up visit to the school to find out how the beneficiaries are using their new skills to enhance their delivery both in class and outside the classroom situation, she shared the following experience with the team. “Before the training, I had limited knowledge on how to assess the low vision students – their learning media, the appropriate learning aid and font size for large print readings. The training has given me adequate skills on how to conduct regular assessment on the low vision children and which cases to refer for medical assistance. I am now on top of my work! Currently, I am assisting the low vision students who use CCTV to do their class work. I have been able to influence the school management to improve the lighting system in the classrooms. I assisted the class masters/ heads to rearrange the low vision students in respective classes. Plans are at advanced stages to re paint the classroom doors with colours that will depict good colour contrast and make mobility to and fro the classrooms easy for the low vision students. During staff meetings, I am given 30 minutes to sensitize my colleague teachers on key issues related to the handling of low vision children in class. There has been an improvement in the academic performance of the low vision students in the school. During the last term examination, only one student had ‘F’ in one subject. They have all passed their examination. I am most grateful to the Perkins International, the International Council for Education of People with Visual Impairment, the Ghana Blind Union and the Special Education Division for the training”.